Earlier this year I decided my next major project was to be plein air clouds. 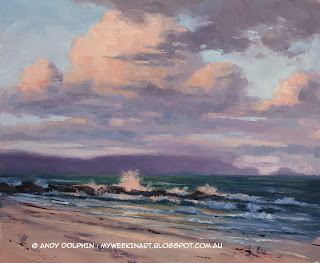 Clouds are sods of things to paint on location because they move much faster than we would usually realise. Even those massive cumulus clouds, that look too big to move, refuse to stay still when you try to paint them. Last weekend, at the end of a particularly gloomy day where the sun refused to shine, I took the gamble and headed down to the coast where I thought I might get some good views of clouds in the evening light. I was prepared to paint grey skies if that's all I had to choose from. I walked along the beach for quite a while, looking in different directions and doing small thumbnail sketches of mostly-grey scenes before finally seeing some colour creeping into a bank of clouds in the eastern sky. Most people probably think of the dramatic reds and oranges of western skies when they think of sunsets but the eastern evening sky can be especially attractive as the clouds reflect the warm but subtle, almost-pearlescent sunset colours. 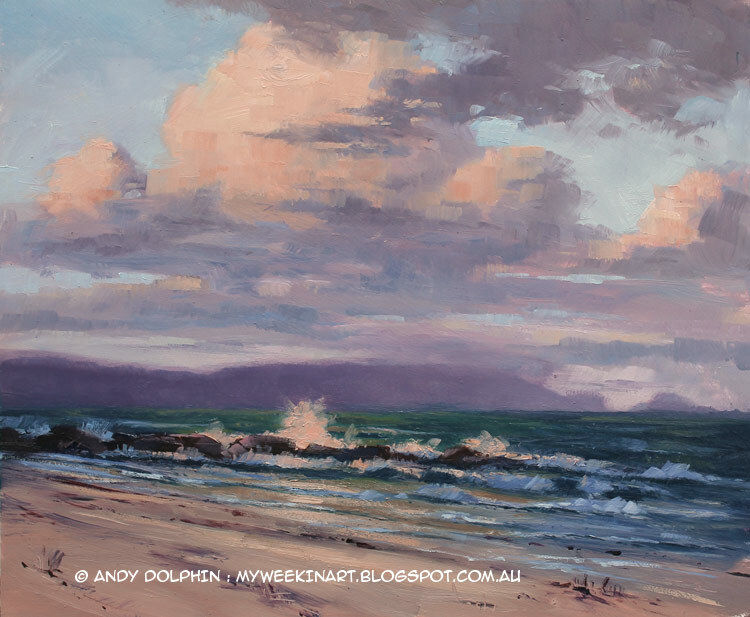 The thing that really caught my eye when I decided to paint this scene was the strong reflection of the sunlit cloud in the ocean. By the time I'd set up my easel and laid out my colours, the cloud had moved - a lot. I used a combination of different clouds and a dose of memory to put the main cloud where I wanted it. When I began, there was no sunlight hitting anything below sky level, but as I was working the central breakers were pleasantly spot-lit, for about ten minutes, so I decided to include that effect. I did a little work on this one back in the studio, mainly darkening the ocean which looked much paler, once I could see it properly, than I thought it was on location. Other than that, it's pretty much how it was when I left the beach. Palette: French ultramarine, permanent crimson, cadmium yellow light, titanium white. I didn't get a location shot because it was dark when I packed up. I had to put my LED headlamp on to find my way back through the dunes to the car park.